Cyril Oberlander, interim director of SUNY Geneseo’s Milne Library, is the winner of the Reference and User Services Association’s (RUSA) 2012 Virginia Boucher-OCLC Distinguished Interlibrary Loan (ILL) Librarian Award. It’s the first time individuals from the same institution have won the award in succeeding years. Ed Rivenburgh, Information Delivery Services (IDS) Project Director at Milne, received the award last year. The national award, administered by RUSA’s Sharing and Transforming Access to Resources Section (STARS), recognizes an individual for outstanding professional achievement, leadership and significant contributions to the fields of interlibrary loan and document delivery and is generously supported by OCLC, the world’s largest library cooperative. The selection committee praised Oberlander for the excellence and scope of his work with the Information Delivery Services (IDS) Project, a resource sharing cooperative within New York State. Members are from public and private academic libraries, New York Public Library and the New York State Library. They also noted his leadership and mentor role as the Internal Project Consultant for the IDS Project team and the GIST team responsible for the Getting it Systems Toolkit (GIST). This innovative approach to ILL(Inter-Library Loan) practice–an important contribution to ILL services for the entire ILL community–is a set of customizable tools and workflows that enhance interlibrary loan, just-in-time acquisitions services, purchase requesting and cooperative collection development efforts. In addition, the committee recognized Oberlander’s prior work at the University of Virginia and Portland State University, where he created a wireless scanning book truck/mobile library workstation, and as the co-creator of LibStatCAT, a library statistical collection analysis tool, and STATCAT, an interlibrary loan statistical database. Oberlander received his MLS degree from the University of Illinois at Urbana-Champaign. His most recent publications include a chapter on the future of ILL in “Interlibrary Loan Practices Handbook, 3rd edition,” (American Library Association, 2011), and “Point-of-Need Collection Development: The Getting It System Toolkit (GIST) and a New System for Acquisitions and Interlibrary Loan Integrated Workflow and Collection Development,” co-authored with Kate Pitcher, Tim Bowersox and Mark Sullivan (all from Milne Library), “Collection Management,” vol 35. (3) 2010, p.222-236, which was republished in “Patron-driven acquisitions: current successes and future directions,” (Routledge, 2011). The award, a citation, and $2,000 cash prize, will be presented in June at the American Library Association Annual Conference in Anaheim, California. The Reference and User Services Association, a division of the American Library Association, represents librarians and library staff in the fields of reference, specialized reference, collection development, readers’ advisory and resource sharing. 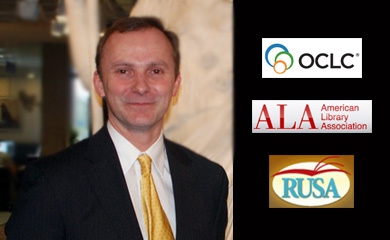 RUSA is the foremost organization of reference and information professionals who make the connections between people and the information sources, services, and collection materials they need.